Dene Nation where the village of Clearwater River is located. Clearwater River is the village of the Clearwater River Dene Nation. 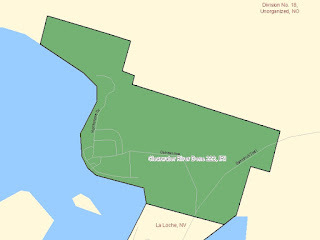 It is situated on the east side of Lac La Loche and shares its southern border with the village of La Loche. 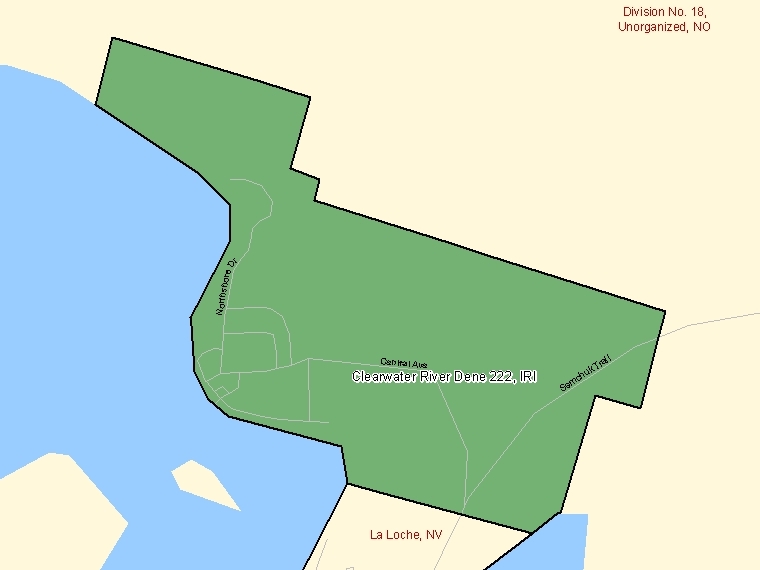 It also has land on the south west side of Lac La Loche and at "The Landing" about ten miles north of Buffalo Narrows. The Landing had a population of ten in 2006. 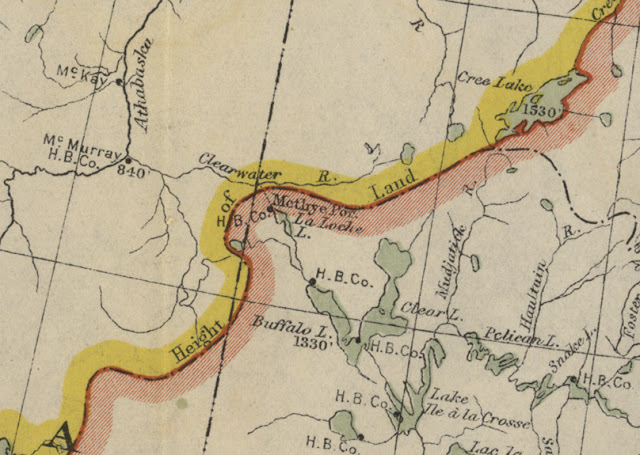 "Although CRDN lands lie within the territorial boundaries of Treaty No. 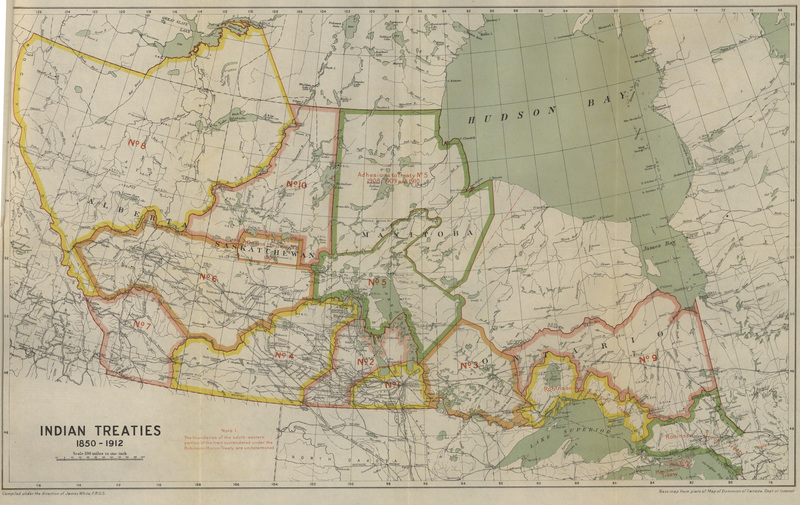 10 signed in 1906, its treaty origins go back to 1899 when Adam Boucher, a Dene leader, signed an adhesion to Treaty No. 8 at Fort McMurray. Boucher's people became known as the Portage La Loche Band, but they were not at first allocated any of their treaty land entitlement and remained occupying traditional lands in both Alberta and Saskatchewan. It was not until 1970 that three parcels of reserve land were finally transferred to the Portage La Loche Band"..........from the book "Canoeing the Churchill". 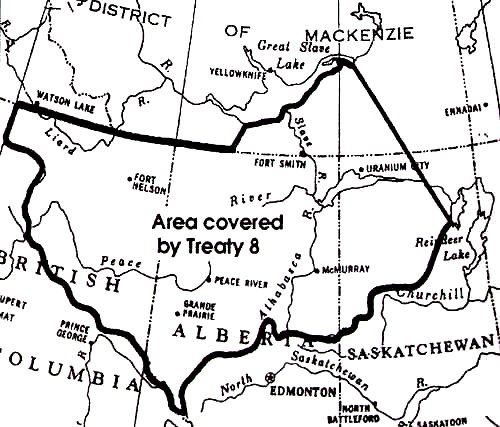 Part of Treaty 8 with Adam Boucher's name is shown below. 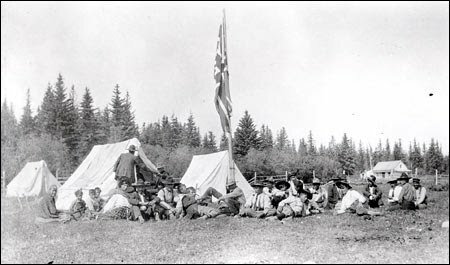 The Chipewyan and Cree Indians of Fort McMurray and the country thereabouts, having met at Fort McMurray, on this fourth day of August, in this present year 1899, Her Majesty's Commissioner, James Andrew Joseph McKenna, Esquire, and having had explained to them the terms of the Treaty unto which the Chief and Headmen of the Indians of Lesser Slave Lake and adjacent country set their hands on the twenty-first day of June, in the year herein first above written, do join in the cession made by the said Treaty and agree to adhere to the terms thereof in consideration of the undertakings made therein. In witness whereof Her Majesty's said Commissioner and the Headmen of the said Chipewyan and Cree Indians have hereunto set their hands at Fort McMurray, on this fourth day of August, in the year herein first above written. Clearwater has grown rapidly since 1979 when it was first officially created. The population of Clearwater increased from 455 in 1991 to 658 in 2006. An increase of 203 or 45%. Some of this increase was from members living in La Loche who relocated to Clearwater as housing became available. As many as 500 members of the Clearwater River Dene Nation live in the village of La Loche. off-reserve as of November 2010." Canada Census 2011 statistics and map. house can be seen in the background. This house at the end of Dene Road is on CRDN land.